Network Security is one of the highly critical aspects of operating a enterprise network. By implementing a firewall, anti-virus and phishing/SPAM protection you can greatly improve safety of your business. Depending on the level of security you desire, we serve complete and managed installations of Cisco ASA, NGFW Security Appliances, Cisco and Juniper Network Appliances, F5 Load Balancers, Cisco Email Security Appliances, and Symantec Anti-virus for the Enterprise. We fully support Cisco Next Generation Firewalls(NGFW) and Cisco Next Generation Intrusion Prevention Systems(NGIPS) and numerous other security devices. As a part of Network Managed Services we will continue local and remote support of your firewalls, routers, switches, DNS and DHCP servers. We understand the needs of small businesses and what it takes to connect your business to the world—simply, reliably, and affordably—so you can stay focused on your objectives. 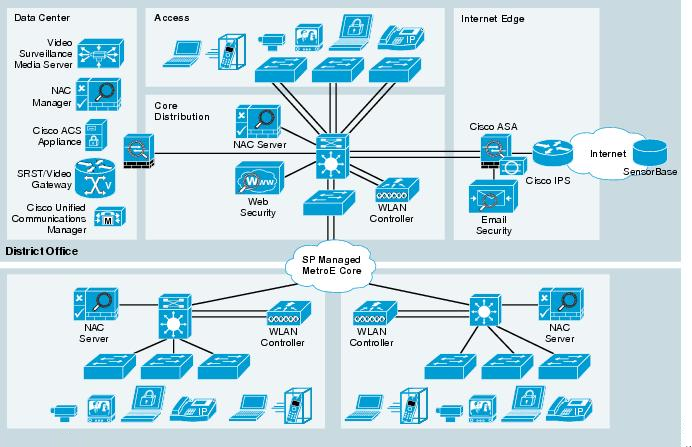 We work with you to build a network solution based on your specific needs. Choices: We make your choice of routers, switches, and wireless access points work together to link devices to each other and you to the Internet. Security: With built-in security, we help protect your company’s most valuable assets—your network and data. Access: Maintain optimum productivity by having your employees connected no matter where they are through highly secure remote access. Through Cisco Small Business Solutions, we help you connect your network, applications, data, and people. We work with you to give you solutions you need to deliver essential services to your customers, extend supply-chain access to your partners, and provide essential business tools to your employees. Once you have a solid network foundation in place, it’s easy to add new technologies and capabilities as you need them. At a basic level, a firewall sits between a private network and a public network (such as the Internet) and examines network traffic to determine whether the traffic should be allowed through. The most basic type of firewall is the network-layer firewall. This firewall examines Transmission Control Protocol/Internet Protocol (TCP/IP) packets at the protocol level. Application-layer firewalls examine the network traffic at a deeper level. Typically an application-layer firewall incorporates the functionality of a network-layer firewall and extends it by examining the data within the packet. Most IPS/ IDS implementations include features such as content inspection to examine the data portion of the network traffic for certain types of data. It provides user focused access control: it grants or denies network access based on who the user is. The identity of or the “who” of an end user is determined by more than merely a username. Blue Coat Systems protects and serves corporate networks. Its proxy appliances protect networks from viruses and other security threats and improve network performance. The devices provide Web content filtering, virus and spyware protection, user authentication, and the ability to limit or block peer-to-peer applications such as instant messaging. They can also be configured to provide WAN acceleration, speeding the delivery of business applications with Blue Coat's bandwidth management, protocol optimization, compression, and caching technologies. - Content filtering, authentication, caching, ICAP relay. - Appliance with anti-virus/anti-malware scanning, thumbprint object whitelisting, and static code analysis for use with proxy appliances. - Malware Analysis Appliance (MAA), sandboxing and virtualization appliance for detection and analysis of unknown threats and files. - SSL decryption via man-in-the-middle attacks to identify threats. - Security Analytics Platform (ATP), full packet capture and analysis to identify and respond to network threats. - Mail Threat Defense (MTD), appliance with malware scanning and application whitelisting for SMTP mail. - Data Loss Prevention (DLP), appliance with malware scanning and application whitelisting for SMTP mail. - Content Access Security Broker (CASB), network security solution to tokenize and encrypt data for storage in the cloud Network Performance Solutions. - WANOP to accelerate internal and external applications for remote offices or distributed employees. - Packet Shaper (PS), Content-aware visibility and control over network and applications. - Cache Flow (CF), caching solutions for Service Provider (ISP) and mobile network operators. Are you ready for Cyber Security? Criminals are rapidly evolving their hacking techniques, and are attacking quickly, making timely security and fraud analytics more critical than ever. Traditionally, enterprise data security has relied on a "fortress defense" approach: keep all assets within a corporate castle and build towering walls to keep out the enemy. However, with an evolving threat landscape that includes targeted attacks, social engineering and spear phishing, the model leaves plenty of vulnerable attack points. As is commonly observed, investing in network security products is like buying insurance. You pay upfront to protect yourself against a possible calamity. For organizations that don't have a quantifiable risk, perhaps very little investment is warranted. But for those at the "dire consequences" end of the continuum, network security investment is as vital as earthquake coverage for homeowners residing near the San Andreas Fault. This is the process through which the user asserts his or her identity and the server validates that identity. A user must supply some information along with the user’s identity assertion that a server can use to positively identify the user. Content filters examine network traffic as it flows to determine whether it contains an attack. Often these systems come with malware scanners and phishing scanners, as well as flexible rules that help you enforce security policies on e-mail with little performance impact. Before you deploy any portion of a enterprise wireless network, you should spend some time considering which wireless access point you want to use. - Support for Wi-Fi Protected Access (WPA) and WPA2 to protect the wireless traffic. - Support for Remote Authentication Dial-In User Service (RADIUS) authentication so that you can use your centralized authentication system to provide strong, integrated authentication. - Support for MAC address filtering to limit which clients can access your network (great for smaller networks). OS and access related threats.